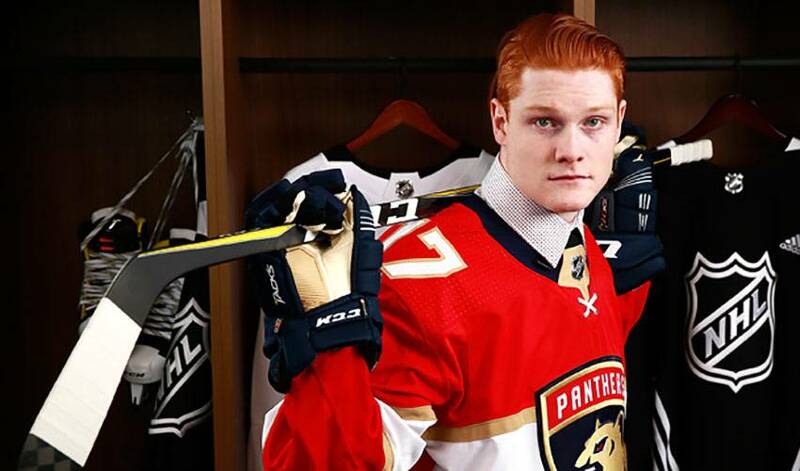 Owen Tippett had to be patient, but after a dozen-day wait, the Florida Panthers rookie made the most of his first impression. Panthers head coach Bob Boughner remarked that Tippett was the best player in Florida’s lineup in their difficult 5-1 loss in Philadelphia against the Flyers on Tuesday. Tippett’s debut has earned him another start with the Panthers at home against Sidney Crosby and the Pittsburgh Penguins Friday. This news makes his Tippett’s older sister Joscelin proud. She and her brother Owen are close and have matching tattoos to prove the point. The words are lyrics from the song 'My Wish' from the country band Rascal Flatts and the words have become a mantra for the two siblings. “We had to ask our Mom (Tracy) for permission,” said Owen, who went with his sister to a tattoo parlour in Barrie, Ont. to get the work done two summers ago when Owen was 16 and Joscelin was 18. “We’ve always been close,” Owen added. “When you're siblings, it’s bound to happen that you’re going to fight. But we were split up there for a while and it just made us stronger. The sibling split up occurred a few years ago, when Owen was about to enter Grade 7. On the advice of his cousin, Mitchell Stephens, a Tampa Bay Lightning prospect who plays for the AHL Syracuse Crunch, Owen decided to depart from his hometown of Peterborough, Ont. to attend the Premier Elite Athletes’ Collegiate about 90 minutes away in North York, just outside of Toronto’s city limits). Tippett’s minor hockey development had hit a wall in Peterborough and he was looking for an alternative. His parents also were in the early stages of divorce proceedings. So Owen and his Mother moved to the Toronto area, while Joscelin stayed behind in Peterborough to complete high school and live with her father. Owen and Joscelin remained close despite the distance and Joscelin was there every step of the way with advice. From the Toronto Red Wings minor system to the Toronto Jr. Canadiens tier II team to the OHL Mississauga Steelheads, the two shared his experience and her journey to become an assistant dental hygienist. Known for his skating and shooting, Tippett finished fifth in goal scoring in the OHL last season with 44 goals and added another 10 in the Steelheads’ 20-game march to the OHL championship, which they lost to the Erie Otters in five games. The Panthers selected Tippett 10th overall in the draft last June and he became the sixth choice from the 2017 draft class to play this season behind Nico Hischier (New Jersey), Nolan Patrick (Philadelphia), Kailer Yamamoto (Edmonton), Filip Chytil (N.Y. Rangers) and Alex Formenton (Ottawa). Chytil and Formenton were the only other 18-year-olds to play in the NHL this season, but Chytil has since been demoted to the AHL and Formenton returned to junior, making Tippett the youngest player currently performing in the NHL. But the personable redhead is not taking anything for granted. He knows he has to continue to perform to stay in the pros, and he also knows that his sister will be there for him in the good and bad times.